A research statement is a 2-4 page document summarizing your past and current research as well as the future directions of your work. Research statements are often requested as part of the academic job packet, especially at research oriented institutions. The following introduction will help you get started on crafting your own research statement for your academic job packet. As part of the academic job packet, the purpose of the research statement is to describe the evolution of your research, highlight your research accomplishments, and illustrate how you are an independent scholar to the search committee. Research statements may also be used to convey your funding history and potential for funding, laboratory and space requirements, and potential research collaborations. The primary audience for your research statement is the search committee. The search committee consists of faculty who are experts in their own research areas but may not be experts in your research area. Some of the faculty might also be from different disciplines than your own. This means that you will need to convey your research in a way that non-experts could easily understand. The search committee’s goal is to hire a successful candidate. To accomplish this goal using the research statement, the search committee wants to determine if you are an independent scholar who produces fundable and interesting research that is compatible with the department and university’s research efforts. Knowing about the research conducted at the institution and the department will help you determine what sorts of resources are already available there for your research, what possibilities there are across campus for collaborative and/or interdisciplinary work, and how your research will fit in to the department. If your research requires specialized and/or expensive equipment that the institution doesn’t have available, it might not be worthwhile to apply to that institution. For example, if you conduct fMRI research, you should make sure the institution has access to an fMRI machine. Knowledge about the institution’s research could also inform you about possible research collaborations, including interdisciplinary connections across the institution. It is also important to know what types of research that the department and institution are interested in, beyond any possible specializations mentioned in the job application’s criteria, to determine how your research fits within the department and, more broadly, the institution. The best research statements have an integrated picture of their research findings, what the research findings mean and their impact, as well as what the overall research plan might look like if you join the department. The following prompts will help you develop the content in your research statement. In the executive summary, describe the importance of your research. In the above image, this professor’s research resulted in the creation of a robot designed to retrieve everyday objects. This research is important because it can assist people with motor impairments in maintaining their independence. The executive summary is an engaging introduction to your research. The goal for your executive summary is to hook your readers and get them interested in reading the rest of the document. You can think of the executive summary as the abstract to your research statement. In your executive summary, you should summarize the rest of the document and discuss the “big picture” of your work. In the past and current research section, describe your research questions and the results you have obtained so far that address your research questions. 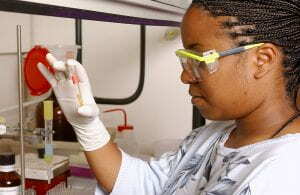 In the above image, this researcher is isolating part of the Leukemia virus to prevent the virus from replicating. “How does my research contribute to new knowledge in my field? The past and current research section includes a chronological summary of your work. Here, you should chronologically summarize how you addressed your research questions with the research you conducted as a graduate student and/or postdoctoral researcher. Your summaries shouldn’t be excruciatingly detailed but convey enough information that the reader can understand the progression of your work. You should also describe how these projects are connected to or build off one another to show that you have a line of research to the search committee rather than a series of disjointed work. In this section, you should also include additional details such as grant funding and citations. If any of your projects were grant funded, mention specifically which projects were funded and who funded them. You should also cite your work and include a references section at the end. If you discuss related work from other scholars in the area, cite their work as well. As part of the future research section, you should describe your plan for involving students in your research. 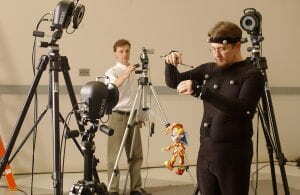 For example, in the above image, a graduate student (left) involved an undergraduate student (right) in their research studying movement by capturing it on video and analyzing the movement data. The future research section includes your research plan for the next 5 years. Here, you should highlight 2-3 novel research ideas that build off your previous work but are separate enough from the work of your graduate or postdoctoral advisor to show that you are an independent scholar. You should address both your short-term goals (i.e., research you can start when you get to the institution) and long-term goals (i.e., studies that are a few years off). In this section, you should also address how you plan to include undergraduate and graduate students in your work as well as which funding agencies you will pursue. You may also want to include information about your laboratory and space requirements. References: List the references for any citations in your document using the style appropriate for your discipline. Your research statement should be woven into a first-person narrative about your research. It should also be written concretely, clearly, and concisely. Use 10-12 pt. serif font, bold headings for each section, bold to highlight key points (e.g., the primary goal of your research), and white-space between paragraphs to make your document easier to read. Because this document may be read by faculty outside of your research area, avoid using technical jargon and use non-specialist terms instead. Schedule a consultation with CTL staff to get feedback on a draft of your research statement.